Thousands gathered in Dublin on 10 July 1907 to see the state visit of King Edward VII, Queen Alexandra and Princess Victoria. The king had arrived to visit the Irish International Exhibition in Herbert Park, which had been opened on 4 May by the Lord Lieutenant, Lord Aberdeen. Present at the opening had been the Ulster King of Arms (Sir Arthur Vicars, in his 14th year in the job), plus his staff from the Office of Arms: the Athlone Pursuivant (Francis Bennett-Goldney), the Dublin Herald (Francis Richard Shackleton, the younger brother of the explorer) as well as four Knights of St Patrick. The Cork Herald (Pierce Gun Mahony) was unable to be present. 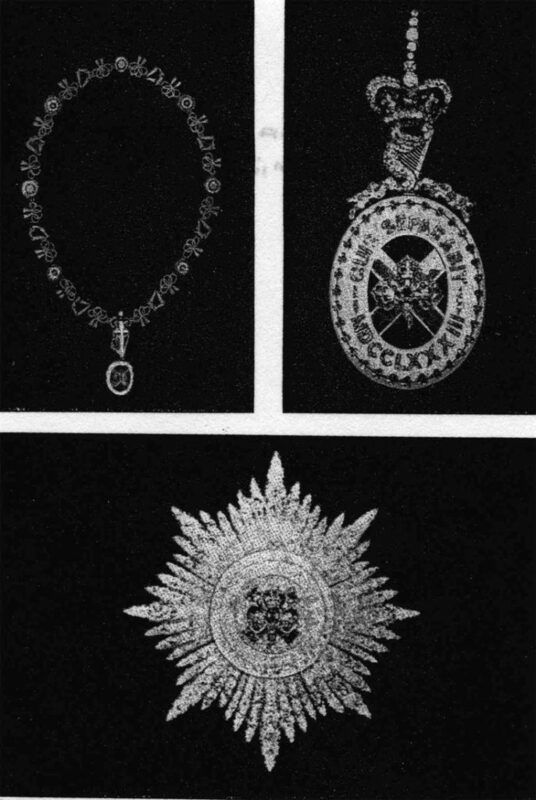 The regalia of the Order of St Patrick, otherwise known as the Irish Crown Jewels, was kept in the Office of Arms in the Bedford Tower in Dublin Castle. In 1907 these jewels were valued at £33,000. It was agreed that the jewels would be stored in a strong room on the ground floor of the Bedford Tower. It was only when construction was completed that it was discovered that the safe was too big to fit into the room so it was put in the library instead. On 28 June 1907 Vicars spotted that the key to the front door to the Bedford Tower was missing and he had to be let in by a policeman. (The key reappeared on 8 July.) On 6 July a messenger from Messrs West and Son, jewellers, returned a gold and enamelled collar of the Order of St Patrick and Vicars gave the messenger the key to put the jewel in the safe. He discovered the safe was unlocked and the boxes containing the regalia of the Grand Master and of the Knights of the Order of St Patrick were empty. Superintendent John Lowe of the Detective Branch of the Dublin Metropolitan Police, Detective Officer Owen Kerr and Assistant Commissioner of the Dublin Metropolitan Police, William. V. Harrel, came to investigate the theft but, unable to cope, they called in Detective Chief Inspector John Kane of Scotland Yard. The safe had not been forced open and no duplicate keys had been used. A reward of £1,000 was offered for information leading to the recovery of the jewels and the capture of the thief or thieves. More than 100 years later, no one has ever been convicted, although Detective Chief Inspector Kane named a suspect but the Chief Commissioner of the Dublin Metropolitan Police refused to act on the information. Tragedy befell the Office of Arms. Pierce Gun Mahony, 36, was shot through the heart on 26 July 1914 in “a very peculiar shooting accident” near his home in Wicklow. The cause was given as his own shotgun discharging while climbing a fence but was it more than accident that blasted both barrels into his heart? Francis Bennett-Goldney became Tory MP for Canterbury in 1910. He was 53 when he died in France on 27 July 1918 in a motoring accident. Frank Shackleton went bankrupt, owing £84,441 12s 6d. He was convicted of fraud in 1913 and, following his release from prison in 1921, he took the name Mellor and died in 1941. In May 1920 Vicars was attacked in his home in County Kerry. Eleven months later, he was taken in his dressing gown from his bed by 30 men and murdered. His house was burned to the ground. A sign was placed around his neck: “Spy. Informers beware. IRA never forgets.” Uncharacteristically, the IRA issued a statement saying they were not responsible for the crime.